Pork Hocks in Coca-Cola Sauce ~ I Can Do That! This dish by the late Thai prime minister and chef Samak Sundaravej, has been bookmarked since 2008 but I never tried making it until now. The reason is I didn't know what pong palo was. At the time I couldn't find the word either on the web or in all of my Thai cookbooks and I have forgotten about the dish. I just discovered here that pong palo is Chinese 5-spice powder which I always have in my pantry. This delicious salty sweet pork dish is a relative of our Filipino-Chinese Pata Tim and humba (hong-bah). Place the pork hocks in a large pot. Pour over the Coca-Cola and bring to the boil. Add the coriander root, garlic, pepper, salt, fish sauce, pong palo and cinnamon sticks. Add enough water to cover. Add the mushrooms. Bring to a boil and simmer for at least three hours. Make sweet sauce with see-uan (I combined dark soy sauce and dark brown sugar). Serve with chilli and vinegar dipping sauce. Cookbook publishers reaching out across the globe should make it easy for us readers to provide the English name translation of their ingredients. They did not make it easy for you. It looks very good that calls for a lot of freshly off the cooker rice to drizzle with its thick and flavorful sauce. You're speaking my language, hehe. Coca-cola sounds intriguing. Will have to try this sometime. Dexie, Coca-Cola lends its sweet maple flavor to the dish. 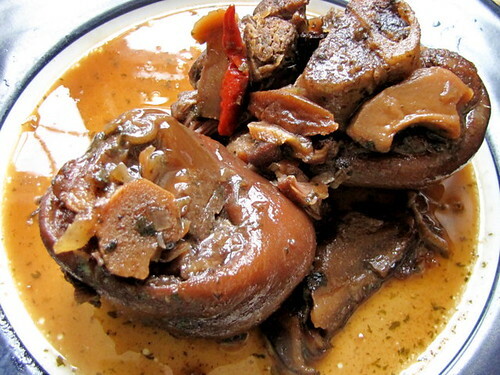 this similar to the philippines' humba.my favorite pinoy food but lot of fats. Hi, are you using fresh or smoked pork hocks? I use fresh pork hocks.